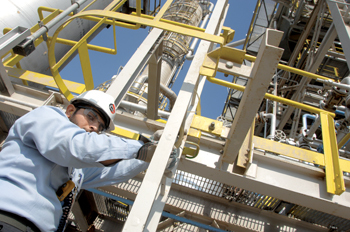 BAHRAIN Petroleum Company (Bapco) has successfully completed a major maintenance project called Hub 2 T&I. The work involved turnaround and inspection of 10 operating units in the refinery. Bapco says it has been scheduling multi-unit shutdowns to enhance the efficiency and cost effectiveness of its operations and Hub 2 was the largest and most complex turnaround and inspection in its history. During various periods in March and April 2014, the Hub 2 units comprising the No 4A Crude Distillation Unit, No 5 Vacuum Distillation Unit, Kero Merox Unit, No 2 Salt Water Main, the Vis Breaker Unit and all units of the Low Sulphur Fuel Oil Complex were shut down to complete major planned maintenance work. Maintenance and inspection work was carried out on 300 pieces of major equipment, 2,700 pieces of smaller equipment, replacement of catalysts in reactors and a significant number of electrical and instrument assets. At its inception, the Hub 2 turnaround and inspection was identified as a unique challenge due to the magnitude of work involved, the large amount of resources required and the fact that the available core expertise will be distributed amongst different units, which are geographically located apart. Planning and execution of this major undertaking was headed by Bapco’s department for shutdowns and major maintenance, a highly skilled and experienced team of engineers well supported by a multi-disciplinary team from other departments. The shutdowns lasted over a month.